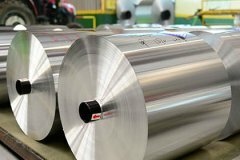 8011A H14 aluminium closure sheet is mainly used as strip or sheet for the production of closures and caps Haomei provide mill finish no surface pretreatment. Aluminum tread plates ccording to the different classification of aluminum sheet alloy. 4x8 aluminum sheet is a common industrial aluminum material which mainly contains aluminum alloy 3003 5052 6061 etc. The coated aluminum Sheet is ideal for producing aluminium composite materials. Haomei Al. is a large-scale listed company in China which is engaged in the processing of aluminum sheet.